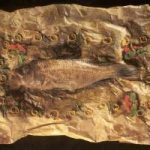 Cooking fish in a parchment wrap is essentially a method of steaming. Francesco urges that the whole fish, not just fillets or steaks, be use. “You need the bones and it has to be thick so you can get all the succulence and flavor,” he says. The touch of citrus gives the fish a decidedly Venetian cast. Spread a large sheet of parchment paper, 18 x 36 inches (45 x 90 cm), on a work surface and brush it with 1 tablespoon of the olive oil. Scatter half the strips of orange and lemon peel on the parchment then place the fish on them. Season the fish inside and out with salt. Spread 1 tablespoon of the tomato in the cavity of the fish along with the oregano and rosemary. Scatter the remaining peels over the fish along with another 6 tablespoons (90 g) of the tomato, the garlic, and red pepper flakes. Pour the fish stock and orange juice over the fish. Cover with 2 more sheets of parchment and roll the edges of the top and bottom sheets of parchment paper together to seal them. Staple them together around the edges. Transfer the entire package to a baking sheet, place in the oven and bake for 45 minutes. While the fish is baking, mix the remaining tomato with the lemon juice, remaining olive oil and basil leaves. Season with salt and pepper and set aside. 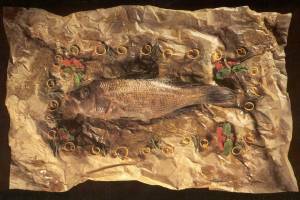 When the fish is done, carefully transfer the parchment package to a large platter. To serve, cut around the edges with scissors and lift off the top layer of parchment. Lift off the skin of the fish, then serve portions of the fish, lifting the top layer of the bones. Remove the large central bones, then serve the bottom layer of the fish. Spoon the juices contained in the parchment and some of the tomato-lemon-oil mixture on each serving.